In an economy where knowledge and yes intelligence leads to power and success lower-skilled, less intelligent workers are replaced by machines. What do we do with them? This a not new problem as we shifted from an agricultural society to an industrial one. Now we are going from industrial to knowledge based society - so knowledge, the ability to use it and understand it, is key. Ability varies and it varies a lot and can't be social engineered that much either way. Many of those attending four-year colleges shouldn't be often ending up with worthless paper and mountains of debt. 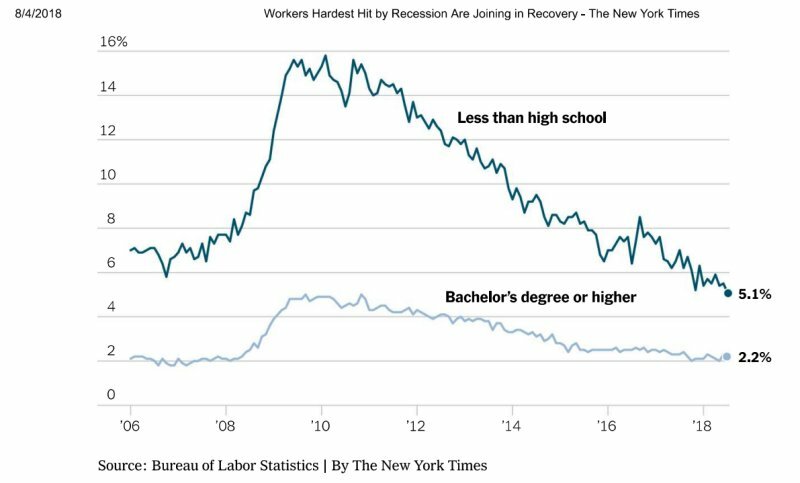 Now we face the problem of business demanding college degrees for non-college jobs, but refusing to pay at the level this degree should bring. We must see people as individuals who are unequal in many abilities to understand how they can plan a future as productive citizens. This should be based on realistic measure of abilities and intelligence. The following seven definitions of "intelligence" are based on Howard Gardner's multiple intelligences. The seven intelligences are bodily-kinesthetic, musical, interpersonal, intrapersonal, spatial, logical-mathematical, and linguistic. What I present is a guide only. For example one with a high aptitude for say math also scores above average in other measures. In a merit based society with half the population below average this creates insolvable problem egalitarian social engineers. We must stop wasting vast amounts of capital on unachievable goals. We all possess the seven intelligences to one degree or another. It's important to understand "difference in degree" in that the best in any particular intelligence cannot be quantitatively be compared to the average who are in many cases not capable of duplicating that level. That no matter how hard one may work at it they simply can't come out even close, if at all. This is due to a complex interaction of genetics and environment. Bodily kinesthetic intelligence encompasses physical skills such as those of professional athletes. This runs from myself who does poorly at sports to a professional basketball player I could never compete with regardless of training and effort. This is a difference in degree. Musical intelligence of course involves sound. One has a highly developed sense of pitch, rhythm, tones, etc. This runs from a country music star such as Johnny Cash to myself who can barely hold a note in the church choir. Again a difference in degree. Interpersonal intelligence involves interactions with other people. One is very good at sensing others' emotions, motivations, and I would add a lot of empathy and an ability to nurture. While good in all occupations this is most useful in those industries that require a lot of interaction with others. I'd also add in my opinion mothering and the ability to nurture children. I believe women are overall best at this and are attracted to professions such as nursing and social work. Women are far less likely to be arrested for violent crime and are the last to want to go to war. I consider interpersonal intelligence one of the most important for the general society. How we interact with others can make the difference between being a social outcast or a group leader or simply functioning as a useful member of society. This is useful for restraining aggression. Intrapersonal intelligence involves knowing oneself. One has a realistic grasp on emotions and limitations. Most important one is to exert self-discipline and put aside instant gratification and impulsive behavior. They exert self-control in stressful situations. Lack of intrapersonal intelligence can lead to self-destructive behaviors, poor judgment, and even criminality. Intrapersonal intelligence I believe is equally important to interpersonal. Controlling basic urges and restraining oneself from irresponsible behavior goes hand-in-hand with interacting with other people. This can be controlled by free will. These two are the only skills one can be taught to control. It's my opinion that a large segment of the general public is deficient in intrapersonal intelligence. Too many if not restrained by laws and social pressure can be very destructive to themselves and to others. This is most pronounced in black communities where the lack of family structure, church breakdown, and bad law enforcement create situations such as the black riots recently in Baltimore Maryland. The next three intelligences are what's measured on IQ tests and are a good indicator of economic and personal success in a technological and scientific based society. We are willing to accept differences in degree in sports or music, but because this ties into economics and social outcome the facts become taboo. But high IQ is not everything - a high IQ combined with low intrapersonal intelligence still leads to negative outcomes. Such is the case of an out of control child exhibiting self-destructive behavior even though both parents may seem be highly successful or normal. The Unibomber is good example of an intelligent person that went on a personal one-man terrorism spree. High IQ people often (not always) achieve great economic success and economic status often means control over others and depending on wealth direct influence on the political system. This is why the wealthy and successful control so much of our society because they really are smart. Lacking interpersonal skills people with this kind of power have no connection with or feelings for average people whom they may in many cases look down on or are even hostile to. This is compounded by the fact they are often economically and socially isolated-segregated from the general public. This is not a matter of Democrat or Republican. The power class too often sees the general public as chess pieces be manipulated or Lego blocks to be constructed into what they view is best for everybody. A high IQ individual lacking intrapersonal intelligence could end up as a political leader that won't listen to reason and destroy the lives of millions Stalin is an example of a highly intelligent sociopath. At the Nuremberg Trials many of the individuals who perpetrated hideous crimes not only lacked remorse, but seemed to be perfectly normal people. Many were quite intelligent and seemed to be good members of their society, but there was something missing in their psyche. They could seem to love their children at home then go out and shoot or gas other people's children. The important question is this a result of upbringing a.k.a. nurture or innate and genetic? The answer is both about 50/50 with wide variation. It's very important according to Dr. Charles Murray how we raise high IQ children as they can carry their personal traits into positions of power. Now let's turn to what is mostly tested on IQ tests. Again I will emphasize that ability varies and is largely in the case of the following three genetic. Lets note that forcing those that lack these abilities to perform as if they do leads to frustration, dropping out of school, and low self-esteem. Spatial intelligence refers to the ability to mentally visualize and manipulate objects. What this means is one can within their mind see the inner workings of a device or grasp the workings of things that can't be seen. A good example of this is electronics where one can mentally see current flow through a complex circuit even when the movement of charges is invisible to our senses. We can only sense the results of the current flow when for example, a heating element gets hot. This is mainly inherited and can't really be taught. Yes, we could train a monkey to place parts on an electrical control panel, but hand that monkey a blueprint with a completely different circuit layout and additional parts they will be unable to do it. Worse change the diagram for every panel. They must mentally transform abstract symbols and concepts from their minds into the real world to build the finished product that looks nothing like the drawing. Auto mechanics can also have great spatial intelligence, but there is a profound difference in degree between a mechanic that can analyze a complex engine problem from one that simply swaps components. This also applies to varying degrees to carpentry, architecture, art, etc. But note that the mechanic with the high degree of ability to analyze a complex machine will likely be above average in math and science. according to Dr. Murray much of this runs together. So a medical doctor with a high degree of spatial ability will also be above average in verbal and mathematical. So a mechanic with high spatial ability and say 70 percentile in math and verbal would likely be a much higher paid specialty mechanic as a career as opposed to a lower paid office manager with a 4-year degree awaiting the next layoff - and buried in debt. Logical mathematical intelligence of course involves numbers, logic and abstractions. This goes hand-in-hand with spatial intelligence in engineering, computer science, and in scientific and technological professions in general on the technician side. This would separate a technician from an engineer. Engineering requires a mastery of calculus, etc. I'm a B student in calculus and simply put I have no business being at M.I.T. and it would be foolish to attend it. I can do some engineering and excel at building gadgets, but I can't design a jet fighter even if I can fix it. Like spatial intelligence this is hardwired often at the genetic level and can't be taught as such. One can't be taught to do calculus unless they have innate ability to do it - even then outcome varies. This is why on standardized tests so many students have problems with even basic math - forget calculus. Linguistic intelligence has to do with understanding and manipulating words and language and grasping their meanings. This impacts everything from learning a foreign language with correct grammar and word structure to reading this essay. Memory and the ability to store and retrieve information also falls under this. Everybody has this to a degree, but like all the other intelligences ability varies and it varies a lot. Law and journalism are two examples of linguistic intelligence. Many talk show hosts started out often as lawyers as are most politicians. Nowhere is the public more helpless and disarmed than by rules and regulations they can't read and by the seemingly arbitrary interpretations of judges. Many of those in government started out as lawyers and know very well that one can usurp power and wealth by burying the public in mountains of rules and regulations they can't possibly understand. They are an example of a lack of intrapersonal skills in they just won't acknowledge their own limitations and refuse to admit their dogma could be wrong - they are driven by emotion not reason. High IQ people lacking intrapersonal skills can be socially destructive. Compromise in the political sense is when the two parties work to each others mutual benefit and not that of the public. The public and the ruling class simply don't occupy the same world. Mass immigration is another sore point with the public. There is no doubt the mass emigration of millions of low skilled and illiterate peasant's drains the welfare system and drives wages through the floor. While the Chamber of Commerce Republicans are at odds economically with the racial socialism of the Democrats for economic reasons, both will compromise to their mutual benefit. We have to notice that the general public is locked out of the process and never even consulted. They lack empathy for the common man or women. To summarize this IQ and intelligence varies and it varies a lot. The people with high IQs thus are more likely to be successful and that often means power. The power struggle among the elite is essentially Wall Street corporatism versus Democratic racial socialism. The elite in fact agree on most things. Think of the massive media consolidation among six very large corporations yet the press in general are shills for the Democratic Party. Wall Street and the left-wing media may seem at odd but not really - they work together. Humans are not social constructs nor is race, reason, or gender. This comes down to a combination of 50% biology/genetics versus 50% environment. Changing the environment won't change the biology. It's time that we be realistic and look at the facts - time to end political correctness. Humans are different and ability differs, that's what makes us individuals. How we handle those differences determines how civil society functions - we ignore this to our ruin. Do we defend individual liberty with protections for minorities? Or do we continue to destroy the fabric of society and use more and more police state tactics to force conformity and pursue unobtainable utopian goals? Ref. Real Education by Charles Murray author of The Bell Curve. PP 18-26.